Laurel looks amazing with and with out her new septum chain. this is really elegant. do you have any other jewelry, or anything you're currently working on? I see the chain is the only thing you have on 108 jewelry co.
i got some new stuff on the way! 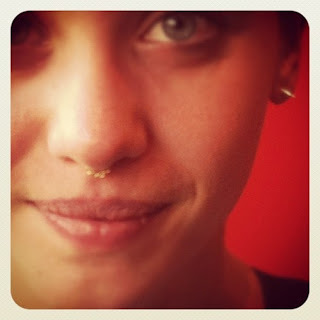 Does it matter what gauge your septum piercing is? I live in LA. PLEASE tell me I can order one of these some how!!? email me @ jcolbysmith@gmail.com if u have any questions. the chains will fit 18-12 gauge piercings. colby! can i wear them on my tragus? do they fit? thanks!